In a move of expert timing, Apple issued its 2010 Progress Report on Supplier Responsibility on Tuesday. That the report arrives just two days ahead of its annual shareholder meeting is no coincidence; no doubt the company would like to have something positive to talk about during the pow-wow, in which shareholders often take advantage of the opportunity to grill the company’s executives on matters of social responsibility. Like many companies, Apple’s manufacturing business is primarily located overseas, in countries such as Taiwan, China, the Philippines, Singapore, and Thailand. Many of these countries have been the source of widespread labor problems, such as sub-par working conditions. In 2006, allegations surfaced that employees of Foxconn, one of Apple’s manufacturers, were being subjected to inhumane working conditions. Apple responded by investigating the claims, and eventually determined that there had been violations, which it set about remedying. Since then, the company has increased its yearly audits of its supply chain to insure that facilities are in compliance with the company’s code of conduct. Problems, however, have persisted. Last year, an employee at a Foxconn plant in China committed suicide after supposedly losing a prototype iPhone; the Chinese authorities subsequently investigated allegations of the man’s abuse at the hands of Foxconn’s security personnel. This year’s 24-page progress report includes the results of supplier audits that Apple carried out in 2009, as well as information about programs Apple has enacted to help improve conditions for workers across its supply base. Among the topics discussed in the report is Apple’s Train-the-Trainer program, which educates human resources personnel at manufacturing facilities on training assembly line workers about subjects like Apple’s Supplier Code of Conduct, occupational health and safety, prevention of work-related injury, and workers’ rights and obligations. Apple said more than 133,000 people have been trained since the beginning of the program in 2008. In addition, Apple began a pilot program in 2009 called Supplier Employee Education and Development (SEED), which provides a computer-based classroom of 500 iMacs and offers English-language courses, technical skill training, and even associate degree programs. The company said 14,800 workers took advantage of the courses last year. In the section under protecting foreign contract workers, Apple discussed two particular cases where the company has taken measures to combat the current state of recruiting and managing foreign contract labor. In particular, Apple has concerned itself with the matter of excessive recruitment fees. These fees are paid by workers to labor agencies which may stretch all the way from suppliers to smaller agencies located in workers’ home countries or villages. While such fees are legal, Apple has taken pains to insure that they meet with locally imposed limits; the company has set a maximum equivalent to one month’s net pay across its supply chain in the hopes of controlling the practice. 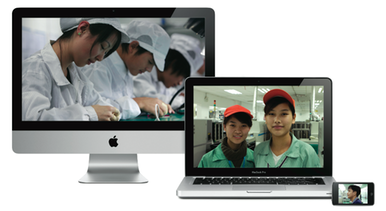 One case dealt with Taiwan, where Apple worked with its suppliers and government officials to look into recruitment processes and help reduce recruitment fees. Apple plans to continue this process in 2010 and extend it to further suppliers. In Malaysia, Apple partnered with three other companies and other organizations like NGOs and trade unions to launch a pilot program that would improve the management of foreign contract workers at a pair of Malaysian factories, inlcuding providing workers with cultural orientation and education on relevant laws and their rights. Apple said that the processes it learned there will be extended to all of its suppliers. Apple reported that it audited 102 facilities in 2009, up from 83 in 2008 and 39 in 2007, for a total of 190 audited facilities in the past three years (the company also included in its figures repeat audits of facilities where violations had been found in the past). Apple also noted that in most of its audits, the companies in question said that Apple was the only company to do such an audit. Audits are conducted across Apple’s supply chain, including final assembly manufacturers—facilities where Macs, iPods, and iPhones are actually assembled; component suppliers—the companies that produce parts such as LCDs and hard drives, as well as smaller Apple products like displays and keyboards; and nonproduction suppliers, which includes office supply vendors and call centers. While final assembly manufactures are audited annually, the component and nonproduction suppliers that are audited are picked on the basis of their past performance and any current risk conditions in the countries where they are located. Among the audited facilities, Apple said it determined that seven of those audited in 2009 were in need of what it termed “corrective actions.” As a result, an Apple-approved consultant was brought into collaborate with the facilities’ management, and the company continues to keep an eye on compliance through the use of verification audits. Apple’s report breaks down its audit results into a number of categories and sub-categories. Of the facilities audited in 2009, Apple says that 72 percent were in compliance with its labor and human rights practices, 76 percent with its health and safety practices, 74 percent with its environmental impact practices, 95 percent with its ethics practices, and 61 percent with its management commitment practices. Certain issues are considered “core” violations, going directly against the principles of Apple’s Supplier Code of Conduct. Such violations, which include abuse, underage or involuntary labor, falsified audit materials, threats or intimidating practices against workers, and serious environmental threats, are acted upon immediately. Apple says 17 such core violations were discovered during the 2009 audits, accounting for 2 percent of the core issues assessed. The facilities in question are placed on probation for a year, and audited again at the end of that time. Of the company’s six final assembly manufacturers, five registered above 90 percent compliance of all issues in the 2009 annual audits, with one as high as 99 percent. The sixth facility came in at 86 percent, down from 92 percent in 2008, which Apple attributed to new violations relating to new standards. The company said it was working to correct the problems. The most common violations among Apple’s suppliers had to do with excessive working hours, improper calculation of overtime wages and pay below minimum wages, deficient benefits, discrimination, occupational safety, ergonomics, environmental impact, and management commitment. Many of these matters are now the subject of clarifying documents that Apple has produced in an attempt to reduce their frequency. Beyond audits, Apple also holds its suppliers accountable on a quarterly basis using Key Performance Indicators, which include stats on a number of matters, including training, injuries, living conditions, and so on. In particular, Apple makes decision on procurement based in part on these indicators, and when suppliers repeatedly don’t measure up, the company ends its business with those suppliers. Moving forward, Apple said that it plans to continue beefing up its supplier responsibility program. The company will continue to keep tabs on its suppliers and focus on eliminating all core violations of its code of conduct. It also intends to expand training for both management and workers and end its relationship with companies that repeatedly violate its practices. Thursday’s shareholder meeting will likely show whether Apple’s investors are satisfied with the company’s progress in this department.